Torus PowerBlock PB 5 and PB 10 are ultra compact and portable Toroidal Isolation Power Transformers, and the most affordable products in the Torus Power line-up. The compact footprint and rugged construction of PowerBlock models make them convenient for use in almost any situation. They look sharp on a component shelf, or can be located elsewhere when space is at a premium. TOT MINI and TOT MAX are ultra compact Toroidal Isolation Power Transformers. The compact footprint and sloped face of TOT models make them convenient for use in almost any situation. They look sharp on a component shelf, or can be located elsewhere when space is at a premium. The original Torus Power models in the RM series remain unparalleled for performance, protection, and value, with models from 5 Amp to 100 Amp. A popular model in the RM series is the RM 20, which has been consistently top-rated by leading audiophile magazines. Smaller models (such as RM 10 or RM 15) are ideal for mid-size systems. Torus Power Wall Mount (WM) Models provide great flexibility for custom installations, and new construction. Dedicated lines can be run to install the power outlets where needed. Select the appropriate power level – ratings of 45A, 60A, 75A and 100A are available (90 Amp for AVR / AVR2 models). 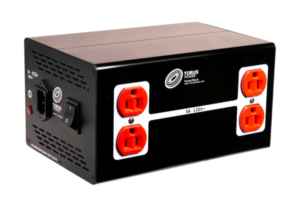 The Torus Power All-in-One (AIO) provides a comprehensive approach to whole system power conditioning. The stand-alone electrical panel has two sections. The top section is pre-wired with 24 industrial grade 20A bolt-in breakers, which are fed by robust 1 ¼” x ¼” all copper buss bars. Advanced surge suppression is provided. The Torus Power FM series pushes the limits of available current rating for Toroidal Isolation transformers. At 25KvA, it is powered by a Plitron built Toroidal Isolation Transformer offering large scale power isolation and conditioning for high end audio video applications in home theater, professional studios and commercial theaters.